This paper builds on a case study on e-learning in Sri Lanka with focus on students underlying beliefs about how one learns. E-learning programs are most often set up with the assumption that students should think, act and learn independently and with underlying values of constructivism and learner–centred learning. For students used to classroom-based, didactic education the transition to the e-learning paradigm is, however, neither predetermined nor immediate. The objective of this paper is to find out if, and how, the e-learning practice manages to transform students into more independent and self sustaining learners. By drawing on Structuration Theory this study analyzes and compares novice and experienced students’ assumptions about learning when asking for a particular support function, because support needs should change if students start adopting the e-learning view on how learning is acquired. Findings show that students increasingly adopt the e-learning view on learning as they progress through the program. Students take increasingly more ownership of their learning and the teacher is no longer seen as the container of all knowledge. The importance of discussions also increases over time indicating that knowledge is no longer seen as being transmitted but rather created. Andersson, A. (2010). Learning e-Learning: the restructuring of students beliefs and assumptions about learning. 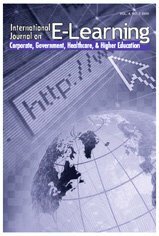 International Journal on E-Learning, 9 (4), 435-461. Waynesville, NC USA: Association for the Advancement of Computing in Education (AACE). Retrieved April 22, 2019 from https://www.learntechlib.org/primary/p/30349/.